The “Business Model Generation” methodology is an essential aid to all business owners and consultants, who want to document, communicate and brainstorm businesses models in a succinct manner. The book “Business Model Generation” by Alexander Osterwalder & Yvess Pigneur provides great examples of how to document business models, along with methods to brainstorm innovative changes in business models for existing businesses. If you like visual aids, then you are going to love the techniques described in this must have book. What struck me, biased as I am toward visual tools, is how their visual models encapsulate the linkage and dependency on the key elements of the business in one page. 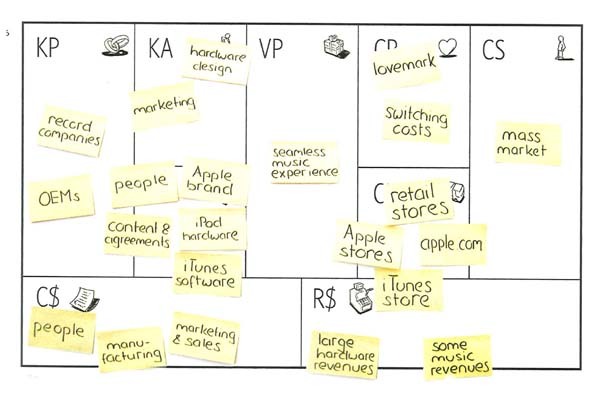 The base technique describes uses a common base canvas to capture the core building blocks of your business model: Key Partners (FP), Key Activities (KA), Key Resources (KR), Value Proposition (VP), Customer Relationships (CR), Channels (CH), Customer Segments (CS), Cost Structures (CS) and Revenue Streams (RS). Key techniques described include brainstorming with the use of post-it notes against the base canvas, as well as my old chest nut of customer value propositions and what’s in it for customers. Once you have your model developed with post it notes, you can really go to town and prepare a visual form of your business with pictures. BTW: Do not be put off by the 72 page book preview available on their web site http://www.businessmodelgeneration.com/. As a result of my pre-read of the preview I nearly didn’t buy the book. So glad I did purchase, based on a recommendation (thanks Matt McKendry). My order on amazon was delayed waiting for a reprint, so hopefully they now have plenty in stock. This entry was posted in A GMC Top Tip, book review, business plans, capital raising, Pitch - Succinct stories, Reading List, Startup 101 - Building Great Companies and tagged book review by Mark Robotham. Bookmark the permalink. 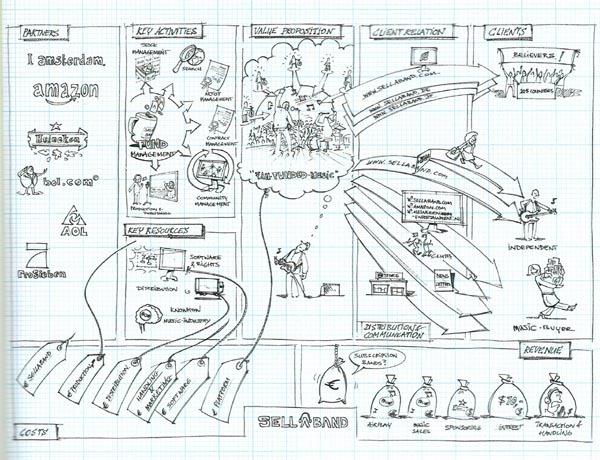 Rob, This is a well written, quick view of Osterwalder’s business modeling world. You are right about the book. It’s invaluable. You inspired me. I have to get blogging again. Big corporations make billions with Ontology and business models. Getting this across to regular business people could change our world. Keep blogs coming on BM. this blog uses a free wordpress theme Misty Look by WPThemes. Click the link bottom right hand corner of blog. I’ve been googling the internet for some related information, but haven’t found anything as good as what you have here. I really, need to boost my Tumblr layout. What do you use here? have on the website. Anyways, I wanted to go with you on your just blog.